As appraisers, we must think carefully about what the appraisal management companies (AMC) or any client is asking us to do. How often are we told by an AMC to do something just because “it’s a lender requirement”? 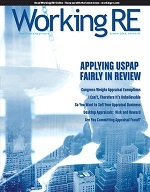 While it is true that we should comply with legitimate requests that fall within the Scope of Work defined in the engagement letter—appraisers must be careful that “lender requirements” do not take them down the path to fraud. As appraisers, we cannot be bullied into doing anything that will violate the Uniform Standards of Professional Appraisal Practice (USPAP), Fannie Mae guidelines or FHA, VA and USDA requirements. Why would you take the risk when it is your name, signature and reputation that are on the line? I want to chuckle when I hear this excuse from AMCs asking me to bend the rules: “Our attorney said you should do it.” Just because someone is an attorney does not make them an expert in appraising or any of the rules and regulations that appraisers must adhere to. You are the expert. Will the AMC or their attorneys be there for you when lawsuits are being filed? Remember that an attorney who is representing a title company, lender, borrower, etc. is not going to represent you in any legal case. You will be alone when things get rough. We all have heard the word fraud but do we know the actual definition? According to Black’s Law Dictionary, “Fraud consists of some deceitful practice or willful device, resorted to with intent to deprive another of his right, or in some manner to do him an injury.” I am not an attorney and this article is not meant to be legal advice but a warning to consider your client’s requests. When asked to do things that may be considered fraud, is the perpetrator committing a crime? I believe they are. It is illegal for someone to ask you to commit fraud. When this occurs, you are being implicated in a crime. I’m going to share some insights that I have gained working as an expert consultant on a mortgage fraud case against an appraiser. The lead attorney making the case against the appraiser provided insight on numerous issues, including how the accumulation of numerous, small errors (what an appraiser might consider small) can be considered fraud. In other words, a few small mistakes can add up to fraud in the mind of the court. Below are some examples of AMC and/or client requests. As you read them, consider whether they are asking the appraiser to commit fraud, violate USPAP and/or blatantly ignore FNMA, FHA, VA or USDA guidelines. I am fairly certain you have come across similar circumstances. Scenario 1: The market is currently inactive, without any active listings or sales within the prior 12 months. We do our due diligence and properly mark on the top of page two of the URAR that there are zero sales and zero listings— with a range from say $1,000 to $100,000. Upon receipt of a revision request from the AMC, they insist that we change the report to read zero sales and zero listings, with a range from $0–$0. Would you honor this request? I have had quite a few conversations with one AMC on this question and with numerous personnel who work there, all the way up to the chief appraiser, who claims to be a USPAP instructor and a “mathematician” (so therefore he was correct). To be fair, there is more than one AMC that demands this obviously incorrect practice. Our view is that not only is it grammatically incorrect, it is also mathematically impossible. Furthermore, I even verified this with a friend of mine, who is a mathematician in the aerospace industry. He concurs that there is not a number between zero and zero, so therefore it is mathematically incorrect. How can you search for a range of comparable sales and listings with a range of $0–$0? Appraisals are to be mathematically correct without exception. None of us would knowingly make a mathematical mistake on the sales grid or anywhere else within the report, so why would you do it here? We eventually had to fire the client who harassed us on this issue. I know this may seem minor but minor issues add up to big trouble for any appraiser. After much discussion with the AMC clerk and my staff appraiser, who refused to do the appraisal incorrectly by arbitrarily changing the report to “as is,” I received phone calls from the chief appraiser at the AMC, as well as my staff appraiser. At first, the AMC’s chief appraiser insisted that we complete the appraisal “as is” and informed me that he would make sure that we got a reinspection fee once the paperwork was filed. I told him the $100 fee is not significant and asked why a re-inspection was needed if the report was to be completed “as is.” At the same time, a survey was completed and sent to us. Once the survey was completed, both the AMC and lender considered this to be a legal reference and requested us to change the report to “as is,” which we refused to do. Next, I received a phone call from the AMC’s chief appraiser, who enlightened me that he had consulted with three of his staff appraisers, as well as the lender’s chief appraiser, and all agreed that because of the completed survey, the report could now be completed “as is” and that the survey should be used as the legal description. As is the case with most AMCs, they were getting pressure to close the deal and having to explain what was causing the delay. If we had completed this appraisal “as is,” would this have been considered a misleading, fraudulent practice, a USPAP violation, or contrary to FNMA, FHA, VA and USDA guidelines? Analyzing this example is very important. We had to stand up against two chief appraisers and three staff appraisers. It is easy to see why a lot of solo appraisers, who are working on their own, would give in under such pressure. Remember that it is your license, career and livelihood at stake. Again, it is highly doubtful that they will be there to help you if things go south. In addition, this is an excellent example of exactly why you should not get your education from your clients. It is you who should be educating them. The subdivision was eventually approved by the county. Does this change your thoughts on this situation? Since the subdivision was eventually approved, would it have mattered whether you did the appraisal “as is”? I would suggest that the eventual approval does not matter. Scenario 3: How many times have we been asked to complete a report “as-is”? The client tells you that it is completely alright to mark the report “subject to” or “hypothetical” as long as you mark the report “as-is.” Does this make any sense to anyone? We tell our clients that we cannot do things because it would be misleading. Our client then informs us that they don’t believe it is misleading and that the infamous “other” appraisers will do it, so we should do it too or else. Who should determine if something is misleading, you or the client? a. As Is Market Value: The estimate of the market value of real property in its current physical condition, use, and zoning as of the appraisal date (Interagency Appraisal and Evaluation Guidelines). Note that the use of the “as is” phrase is specific to appraisal regulations pursuant to FIRREA applying to appraisals prepared for regulated lenders in the United States. The concept of an “as is” value is not included in the Standards of Valuation Practice (SVP) of the Appraisal Institute, Uniform Standards of Professional Appraisal Practice, or International Valuation Standards. i. A condition that is presumed to be true when it is known to be false (SVP). In layman’s terms, subject to is an element of the appraisal that the appraiser observed during the time of appraisal that needs to be remedied to meet certain guidelines, a proposed new construction, or proposed improvements, etc. There currently is not an active definition in the AI Dictionary for “subject to.” How can anything be as is/ hypothetical or as is/subject to at the same time? Would the report be considered misleading if you do this? It is our opinion that it would be. If you believe information to be misleading, it does not matter what anyone else thinks—it’s your report. How are you going to explain to the state board investigator that information you initially provided was misleading but that it is not on the next correspondence? To knowingly submit something that you believe to be misleading is fraud; just reread the definition of fraud. Scenario 4: The subject property was originally built as a duplex with identical first and second floor units. The appraiser correctly appraised it as a two-unit on FNMA Form 1025 (Small Residential Income Property). A client stated that it was a lender requirement that the appraiser prepare an owner-occupied duplex on a 1004 form, and report the second unit as an accessory unit. If the subject’s highest and best use is a duplex, then it cannot and should not be completed on a 1004 as a single family with an accessory unit. According to FHA, an accessory unit is defined as: a small, selfcontained dwelling, typically with its own entrance, cooking, and bathing facilities and that shares the site of a larger, single-unit dwelling. They may be attached or built-in, such as a basement apartment, or detached, such as a backyard cottage. The owner of the accessory dwelling unit is the same as the owner of the primary dwelling. An accessory unit is sometimes called an accessory apartment, ancillary unit, carriage house, casita, garden suite, granny cottage, granny flat, granny unit, laneway house, mother-in-law flat, secondary dwelling unit (SDU) or sidekick. In this example, the appraiser decided to follow the “lender requirement” and did the appraisal as a single family with an accessory unit on the 1004. On the 1004 version they marked the highest and best use as a single-family home. In the original and “correct” appraisal, the highest and best use was determined to be a duplex. However, now they are asking for a change in the highest and best use to single family. Let’s stop and think about this a moment. Can the highest and best use be both? Should we change the highest and best use based upon a “lender requirement”? Can both appraisals be correct? How can the second unit be an accessory unit, when both units are identical in size and layout? Why are they asking you to do the appraisal this way? It appears that the lender and AMC are trying to disguise the loan as a single-family loan to be able to sell it off to the secondary market. This is clearly an issue in which the AMC and lender are looking to deceive the purchaser of the loan. I don’t know how this cannot be considered anything but fraud. How can an appraiser defend this if or when things hit the fan? They gave regulators, authorities, the FBI and opposing counsel all the data they need to hang them. As residential appraisers, we are often out here on our own. We cannot rely on our clients (AMCs) to guide us. Their interests are not always our interests. When an attorney gives us a legal opinion, we must remember that they are advocates for their clients and have no obligation to do what is best for us. I have been involved in federal mortgage cases, as well as cases in front of state regulators. Each and every time, the appraiser is alone. The AMC and/or attorney who instructed the appraiser to do “X” are nowhere to be found. They are not there for moral or financial support. In fact, I have seen the client (bank) testify against the appraiser. The client was the one who said “it’s no big deal, we just want to get this deal done.” Lead attorneys in these cases are always amazed by an appraiser who commits fraud for no extra money. 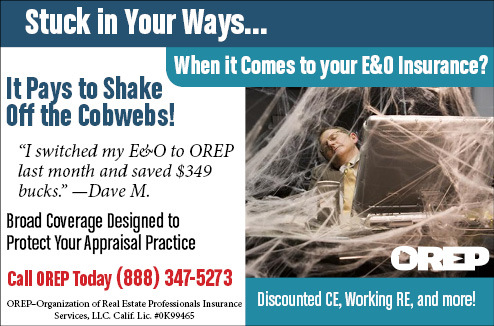 In fact, in one case I was involved in, the appraiser actually gave the client a discount! I have seen appraisers spend tens of thousands of dollars for their own defense. In one case I heard of an appraiser spending over $500,000 defending himself. How many of us have that kind of money? Few appraisers do, and if you do, why would you want to spend that on attorney fees? “One of the best courses that I have had in 17 years!” -Amy H.
Must-know business practices for all appraisers working today. 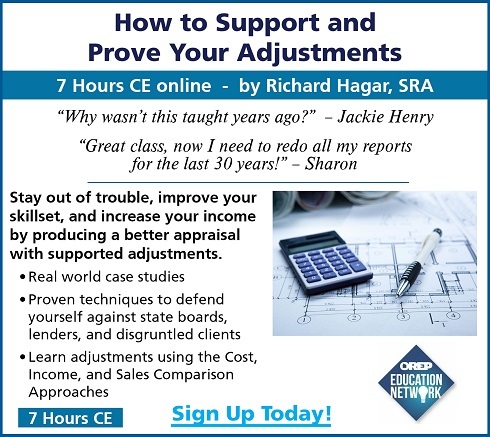 Ensure proper support for your adjustments. 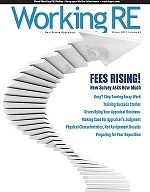 Making defensible adjustments is the first step in becoming a “Tier One” appraiser, who earns more, enjoys the best assignments and suffers fewer snags and callbacks. Up your game, avoid time-consuming callbacks and earn approved CE today! Edward Cline, SRA, AI-RRS, GAA, RAA, MNAA is the owner of Ed Cline Appraisals, a busy appraisal office with 10 appraisers, two trainees and six support staff in Beaver Falls, Pennsylvania. He is a Certified General appraiser in Pennsylvania and Ohio. He performs both residential and commercial appraisals and is a licensed Real Estate Broker and the owner of Premier Property Management Services. Cline is a licensed Pennsylvania contractor and holds a certification in lead abatement. In addition, he is a certified FHA 203k consultant and an active real estate investor. Great article, Ed. In my experience, most of this kind of pressure happens when someone on the other side wants to get something done and does not care about your liability. I take issue with the comments about Scenario 1: The fields on top of page 2 are the “RESULTS” from the statistics gathered when the appraiser creates the 1004MC form (for the subject property). They differ with on each report. If there are NO comparable sales or listings; then, there is NO range. Since a numerical entry must be entered into these fields; the number is “0” and “0” for the range of sales and then listings (with further comments added to the report to explain). It’s NOT the range that you searched…it’s the “results” that you got when you did your search. This information must agree with the 1004 MC form in the same report. I hope that the appraiser is NOT search for comps by price range! YES! I agree with you R.Lankford. It’s not about the “math”, it’s about the FORM requirements. When this form originally came out, there were actually classes held in order to make clear what the form requirements were…what the form was asking for. Ed outstanding article. Great reminder to all appraisers that aren’t active participants in perpetuating such frauds. Hopefully it will also serve as a cautionary warning to those that are; in the mistaken belief they can debate their way around the rules. My favorite was a 2055 order when on inspection and assessor visit discovered a singlewide personal property mobile home on acres across the street from a prison. Everyone for weeks screamed at me when I submitted on a general purpose old form basically giving value to the dirt and the utilities. Eventually I ignored them and they accepted the appraisal as submitted. moral of the story-if asked to do something you think is funky, ask a trusted adviser, do research and STICK TO YOUR GUNS! While it’s always nice to have strong opinions, on vague sections of the form perhaps a little explanation is in order before you “fire” clients. After all, the top of page 2 URAR (your scenario 1) is the RESULTS of the search. If there are ZERO “comparable” sales in the neighborhood, how can you have a price range? Are you using price range to determine what is “comparable”? If not, couldn’t that range just as easily be $0 to $1 million? When choosing to stand your ground about what is “misleading”- perhaps a little narrative explanation is in order rather than rigid adherence to what you “think” should go in a blank on a form. Your confusion about “as is” versus “subject to” is telling. “Subject to” has not been defined in the Dictionary of Real Estate Appraisal because it’s not an appraisal term or methodology. It’s a set of requirements for a WAY that certain hypothetical conditions or extraordinary assumptions are used as required by certain secondary market participants like Fannie Mae and others. USPAP doesn’t define “subject to” either. USPAP defines the tools we use (EAs and HCs) to do an appraisal “subject to” for those types of clients. I’m all for standing our ground on legitimate issues and I’ve certainly had my battles with AMC front-line people, but I’d encourage the author to do less “form based” reports and these items will become clearer in the wider world of appraising before yelling “Fraud! Fraud!” to the hills. Thank you for expressing what I was thinking about the top of page 2. Really, a range of value for the “0” number of comparable sales?????? If you have 0 sales, you have 0 range. It all goes back to USPAP being a one sided document. The appraiser is bound to abide by it. USPAP mandates “appraiser independence”. When certain outside forces demand revisions, which happens a lot, to make these changes often imputes appraiser independence. We need to start to claim this right of ours. Thank you for the interesting read. It is apparent that you are not a fan of AMC’s and that is your business decision. However, it should be noted that your opinions are questionable and you paint with broad strokes. Your opinion on Scenario 1 causes concern. Why would any appraiser use a value range to search for comparables. This could be a USPAP violation as well as certification 18. 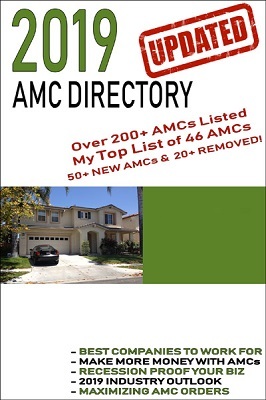 The AMC cant guide any appraiser and if they do, they could be consulting. If a client gets a repurchase letter, do you not think they wont go after the AMC also? You use the word fraud in several areas, I would suggest using misleading until a court of law has determined fraud was committed. Absolutely Right! I thank Mother Nature everyday, that Chuck Brooks (RIP) was adamant that I be taught properly, including how to think and address issues. Has worked for 53 years. Integrity is not a word still developing under change guidelines since it is already set in stone. This is a great article with great advice. Thanks for sharing Ed. This is a great article with great advice! Thanks for sharing Ed. LENDERS AND AMC’S SHOULD ADHERE TO USPAP. YOU WANT TO SEE THINGS CHANGE VERY QUICK! The definition of fraud that you cite (and every other definition I’ve read) uses the word “intent.” How does the accumulation of small errors or simply doing what an AMC requests show intent to defraud? Neither, to me, seem to show that the appraiser was acting knowingly or willfully in order to deceive.